Telesmart delivers a smart, secure and reliable foundation for your essential voice, video and data applications. Telesmart provides all your essential communication infrastructure to enable effective voice, video and data collaboration. The backbone of any successful business is a robust, secure and powerful Wide Area Network. We design and manage bespoke network solutions that ensure quality of service and reliability. We deliver the best connections across tier 1 carriers to ensure optimal performance and affordability. True system continuity and redundancy is achieved via our diverse carrier network. We provide network security and hosted firewalling to ensure the integrity of your network, designed to your exact requirements. What is a WAN and Why do I need one? Improve collaboration and consolidate your critical services. Deliver voice, data and video applications (hosted, in the cloud or on premises) and connect to our web services partners, Amazon and Microsoft Azure. Increase Productivity by having an on-network meeting space to house documents, applications, designs, & communicate over a secure & reliable core backbone. Receive Network Reports providing comprehensive information about every monitored device and how they are performing. We know that the quality of your entire customer experience, whether it be your end customers, partners, or your people rely on a fit for purpose, secure, and expertly managed Wide Area Network (WAN). Telesmart design and manage bespoke WAN solutions for multisite organisations that share critical business applications and wish to improve digital collaboration and quality of service. Telesmart WAN Solutions enable you to link all your locations together via a wide area data network and connect them to the Internet. Our highly reliable and scalable solutions can be based on a variety of wide-area transport technologies and network access methods. Count on our expert advice to choose the most appropriate solution based on the unique needs of your business. Improved security, that can be managed centrally reducing deployment, complexity and ongoing management costs. 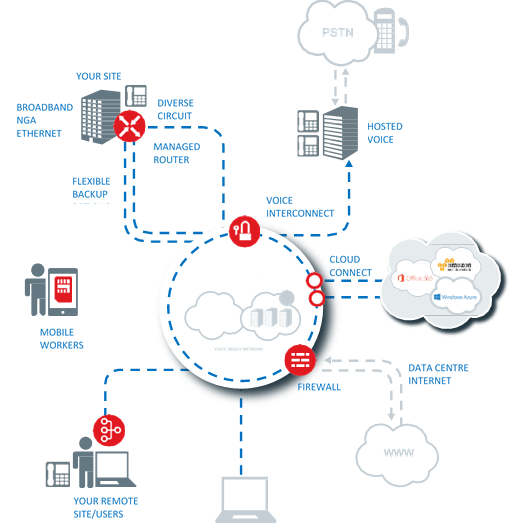 Centrally hosted voice solutions are best delivered over a WAN connection where the quality of voice traffic can be guaranteed. Flexibility. Multiple business units can run out of a single site but still maintain security of files, applications and other services specific to their business. They can also share services such as voice and follow me printing. Centralised firewalling via Fortinet high availability UTM service backed up by Telesmart’s Juniper HA firewall solution. Why Choose Telesmart for Managed WAN? We provide the best connections across tier 1 carriers to ensure optimal performance and affordability. Our solution architects and service teams will work with you to design the optimum managed network solution suited to your business needs. We will accurately match the right internet connectivity services to your performance; availability, security and budget requirements. Working with Telesmart removes the burden of project managing and carrying out the migration and delivery of your network yourself, saving you time. We take care of the ongoing 24×7 management and monitoring of your service. However, you retain the control you need with access to around the clock support and online reporting. We work with you to ensure your service is continually optimised to meet your needs.